There is some good news for Michael Pineda and A.J. Burnett owners. 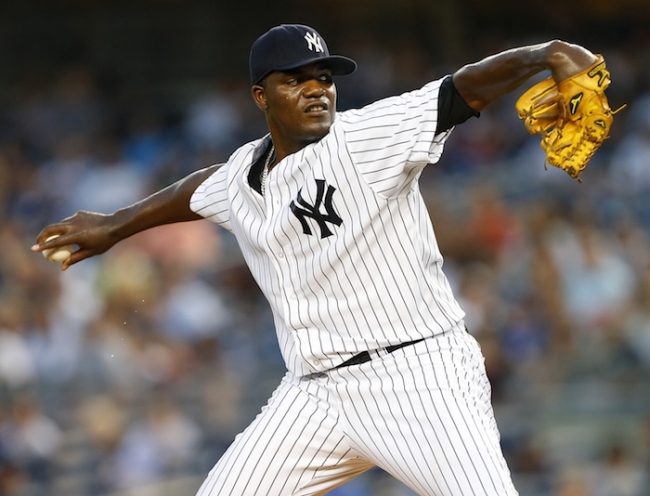 Pineda went out on a Triple-A rehab start on Sunday, allowing two earned over four innings. The Yankees have not said if he needs another rehab start or not, but he should return over the next week or two. He was expected to miss a week or two more before hitting a rehab start. Burnett has started to throw, and last week I was not optimistic about a return, but he is ramping up activity. He should likely be on return watch for early September. Clay Buchholz is by far the most pitcher I am not optimistic about returning this season. He has yet to throw yet, and will likely be cleared shortly, but the rehab process will take some time. Jose Fernandez has no shift in news from last week, and the most we can say is he says he will pitch again this season. He is still worthy of a lineup spot, unless you are desperately chasing pitching points. He is however scheduled to start throwing again. Sean Doolittle is on his way back, heading out on a rehab assignment. He may not get the closer role when he gets back, just like earlier this season. Steven Matz, the young New York lefty, is on his way back, and will likely join the rotation in early September. George Springer update! He has been cleared to resume baseball activities, and will spend the remainder of August rehabbing. He should be due back in the lineup for Houston early September. Dustin Pedroia is on a similar time frame has a week left of exercises before being cleared to go out on a rehab assignment. Pedroia has been a stable fantasy second baseman this season. Josh Harrison is set to return in the next few days, the utility player out of Pittsburgh would be a nice addition for fantasy teams in need of runs and stolen bases. Denard Span will likely be back at the end of the week, of course with no setbacks. He has already had one with his bad back. Jason Kipnis should also be activated fairly soon. Speaking of bad backs, David Wright should be activated from the DL before the Mets head to Colorado. If he stays healthy, the Mets offense could be tough from here on out. Matt Holliday and Matt Adams are dealing with severe quad strains, but both are taking swings. Adams is likely done until the end of the year, while the timetable is unclear for Holliday. A few day-to-day guys to keep an eye on Matt Wieters, Michael Brantley, Maikel Franco, Hanley Ramirez, and Pablo Sandoval. Those Red Sox guys have been soft all season, so no shocker there.